The County Medals presentation and Player of the Year Awards took place at the Stadium Cafe Bar on Friday 12th November. 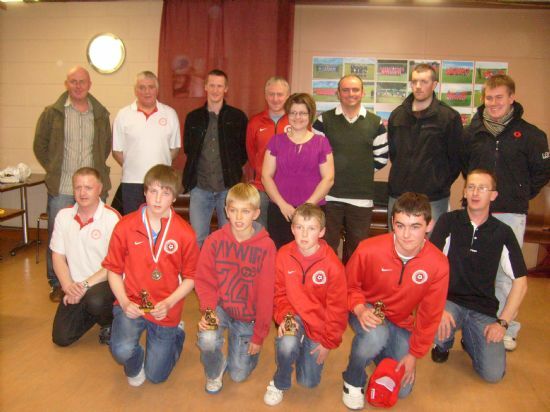 The County Medals were sponsored by Orkney Builders Ltd and Stephen Kemp attended on behalf of the company to hand out the medals to the players who represented Orkney at Under 11, 12, 13, and 15 levels. 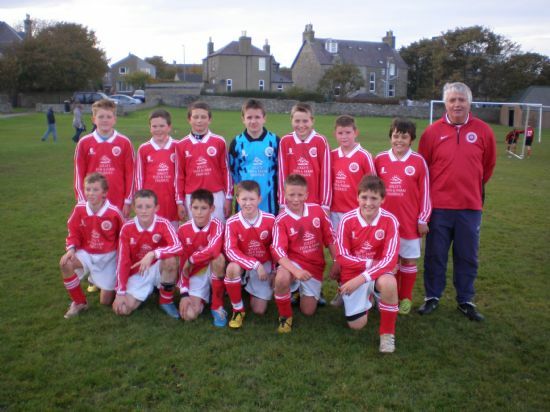 On Saturday 2nd October the OYDG under 11 and 12 squads travelled across to Wick to play East End Boys Club and Caithness United. After the winds and rain of the previous day which put a big question mark over the whole trip the squads were met by a fine day to travel with the only issue being a very wet pitch. First game on was East End A against Orkney A. This was a good even game which ended goalless although each team had chances to win. Second game on was East End B against Orkney B. The Orkney team got off to a fast start and were two goals up at half time thanks to two good strikes from David Coates. The second half was the opposite as East End scored two goals which resulted in the match finishing all square, a result that was quite disappointing as Orkney had most of the play and should have scored more. The penultimate match was East End A against Orkney B. East End A proved to be too strong for Orkney B running out 5-1 winners with Orkney’s consolation goal coming from an excellent strike from Aiden Groundwater. The Orkney boys to their credit never gave up despite being 4-0 down after seven minutes. The final match of the day was East End B against Orkney A. After a slow start to the match Orkney took the lead when the impressive Jas Sitte scored with a stunning volley. This proved to be the turning point in the match as Jas scored his and Orkneys second just before half time. The second half was a lot better with the Orkney boys scoring a further 3 goals, one more from Jas for his second hat-trick of the day and two from Rory Crawford, the match ending 5-0 to Orkney. Both Orkney teams should be pleased with their overall performances with Jas Sitte for the A team and David Coates for the B team catching the eye with their performances, but all players deserve a pat on the back for the way they conducted themselves on the journey to and from Wick. Well done lads. Orkney started playing uphill and after 5 mins play some good work by Liam Delday who crossed the ball into the 6 yard box, but the chance was missed by the Orkney strikers who had taken too long to get the shot in. Shortly afterwards Caithness took the lead. Orkney were still creating chances and after another good ball into the box, the ball was deflected by a Caithness defender into his own goal. A few minutes later Caithness went 2 - 1 up however Orkney were still playing well but failing to take their chances. Orkney conceded again to Caithness and with no further scoring found themselves 3-1 down at the end of first 30 minutes play. In the second period Orkney played downhill and were playing the better football and after some good passing scored another goal. After some poor defending Caithness scored again to make it 4 - 2 but Orkney fought back to make it 4 - 3 at end of second 30 minutes play. In the third period some exciting end to end play resulted in Orkney scoring again to even the scores at 4 – 4. Caithness were pressing hard in attack and a brilliant and acrobatic save by Lewis McManus kept it even. Caithness continued with attacking play and secured another 2 goals. Heading into the final 15 mins Orkney played their best football of the match and scored 2 more goals to make a final score of 6 – 6 and even had a goal disallowed with only excellent goalkeeping by the Caithness keeper preventing Orkney from winning the match. Goal scorers for Orkney were Joe Wilson (2), Alex Griffiths, Liam Delday, Magnus Stephen, and an own goal. All of the Orkney squad played really well in what was a very physical match. Some challenges and lack of sportsmanship by the home team should have been dealt with firmer, however the team should be proud that they have been undefeated this season. Well done boys! Performances of the day came from Joe Wilson, Liam Delday and Lewis McManus with player of the day being Calum Drever. Well done Calum. 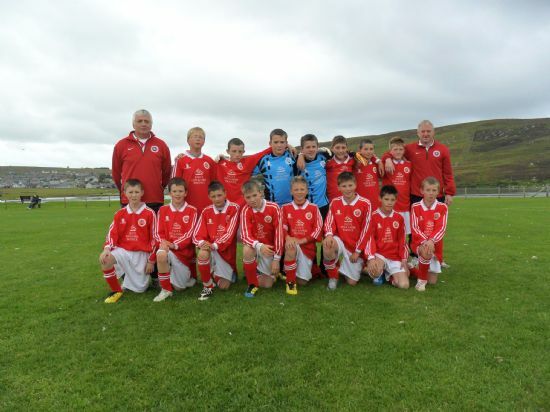 On Monday 30th August the Under 12 County matches were played at the Clickimin Centre in Lerwick. First game up was the Under 12 A game with the Orkney boys quite confident after winning 5-0 against Shetland earlier in the year although the coaches were keen to point out that the game would be a lot harder. The game started with both teams totally committed but playing very much kick and rush football. From what looked like a cross that the Shetland defence should have cleared, the ball somehow found Orkney captain Liam Delday in the box and he chipped the ball into the back of the net to give Orkney an early 1-0 lead. The rest of the half was fairly even with both teams having good pocession without really creating goal scoring opportunities. The second half was more one sided with Orkney playing downhill and having the wind behind them, they constantly had Shetland under pressure. However, they were still playing rushed football and credit must be given to the Shetland boys for forcing Orkney to play this way. Eventually Liam Delday beat a couple of players out on the right and played a perfect cut back for Toby Macleod to slot the ball into the net and put Orkney 2-0 up to secure the victory. This was a hard fought victory against a far bigger Shetland team who had improved a lot since they played each other in June. Man of the match for Orkney A was Ciaran Drever as his all round play made him a stand-out in the Orkney team. 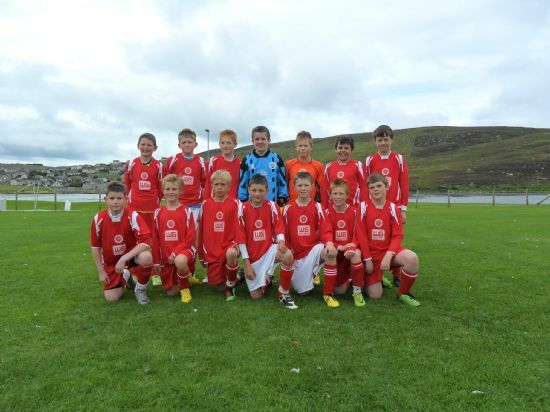 Next up was the Under 12 B game which Orkney won earlier this year 1-0 in Kirkwall. Orkney soon found themselves 1-0 down as when an Orkney player got injured the Orkney boys all stopped and did not play to the referee's whistle. Shetland moved the ball forward quickly and scored from this incident. This was a mistake that the boys will have learnt from. After this Shetland took control of the game for a period but as the first half went on Orkney came back into it and scored an equaliser through Oskar Stout to level the match. However with virtually the last kick of the first half Shetland regained the lead. The second half was more one sided with Orkney playing with the wind behind them and constantly having Shetland under pressure. However they failed to take any of their numerous chances. Eventually Orkney were caught out by a counter attack and the young Shetland forward scored a good second goal unfortunately injuring himself in the process. Credit to the Orkney boys who did not drop their heads and went right back on the attack for Ben Stout to score a cracking goal from just outside the box. Unfortunately it was all too late as the final whistle went with the score 3-2 to Shetland. The B game was a far more pleasing game to watch with not so much kick and rush football. Whilst the loss was a sore one for the Orkney boys given they had so many chances in the game, the Orkney coaching staff took a lot of positives out of the performance. Man of the match for Orkney B was Robert Sinclair. The coaches would like to thank all the parents who made the trip up and helped out, as well as Shetland Junior Football Association for a well run and enjoyable weekend. As usual, Orkney started slow, and allowed the Shetland team to dominate, but determined defending especially from Mark Sinclair and Taylor Pilkington Tait, kept the scores level. But on the 15 minute mark, Ronan Osborne came quickly off his line to claim a through ball, but was harshly judge to have fouled the Shetland forward, and a penalty was awarded. Shetland finished this well. This made Orkney more determined, and all the team battled hard. With the introduction of Andrew Harold into the centre of midfield, Orkney looked a much better team, winning more ball, and creating some great chances. They eventually got their reward just before half time, when Ross Sclater headed home from close range, after good work down the left by Thorfinn Miller. After the restart, Shetland again took control of the game, and their midfield started to dominate. But Orkney had the better chances as Ross Sclater always looked dangerous every time he was on the ball. But eventually as the Orkney boys tired, the Shetland midfield started to dominate, and luckily some superb saves from Sam Kennedy kept it even.Unfortunately with only a few minutes remaining, a shot from outside the box was one too many, and the Orkney keeper was beaten. Orkney Starting XI :- Ronan Osborne, Taylor Pilkington Tait, Jason Scott, Jack Patterson, Mark Sinclair, Logan Peace, Thorfinn Miller, Ryan Sutherland, Seamus Mackay, Joe Moar and Ross Sclater. Subs: Liam Delday, Andrew Harold, Alex Stevenson, Kieran Docherty & Sam Kennedy. The squad travelled South on Monday 5th July for two matches to be played on consecutive days. 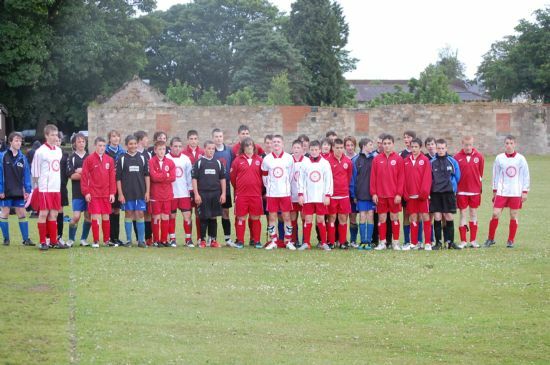 On Tuesday night the boys were in Fife to take on Cupar Colts in their first match. There was a good turnout of spectators despite the wet night and Orkney served up a 6-1 victory against their hosts. Orkney started the game very brightly and early attacks were orchestrated through good link up play through the midfield with Kyran Taylor very much involved down the left wing. He was causing all sorts of problems for the Cupar right-back and it was no surprise when one of his crosses found Ryan Williams at the back post to steer the ball home for a deserved lead inside ten minutes. Cupar Colts were working hard to close down the movement of the Orkney team but were lucky not to be a man down following a cynical challenge on Kieran Rendall. A second goal duly arrived this time from Kyran Taylor with a tight finish at the keeper's near post. The same player followed this up with a stunning goal from the left wing, taking a pass on the left touchline before sending a looping volley into the net with the keeper having no chance. Cupar to their credit kept their heads up and were given a lifeline when Toby Penwarden gave away a penalty. However, Scott Russell made an excellent save. The home team did pull a goal back when a simple through ball allowed the forward to finish cooly. Half-time: Cupar Colts 1 Orkney 3. The second half started poorly for Orkney with Ben Sutherland being shown the red card for raising his hands in retaliation to a Cupar player and this provided some pressure on the Orkney defence which coped well with a string of attacks being matched by some timely tackles notably from Jimmy Craigie in the heart of the defence. Orkney began to settle after this and the move of the game resulted in an Orkney goal when Kieran Taylor back-heeled a pass for the overlapping Liam Drury to cross for Ryan Williams to grab his second. This knocked the wind out of Cupar and Kyran Taylor completed his hat-trick before Lee Wilson added a sixth to seal a well-deserved victory. Onto Wednesday morning where the team faced Mintlaw Academy on the outskirts of Aberdeen. The game was played in glorious conditions but unlike the weather Orkney found themselves 3-0 down inside twenty minutes. Looking heavy-legged from the previous nights game, poor marking and bad defensive errors earned Mintlaw a comfortable cushion. Orkney rarely threatened in front of goal but did reply when Aiden Milne finished smartly inside the box. Following a reshuffle at half-time by the coaches Orkney started the second half much better. However, they were duly caught out by a long ball when Scott Russell failed to gather and the forward had a simple tap-in for 4-1. But rather than let their heads go down, the Orkney team showed great resilience and exerted continuous pressure on the home goal. Darren Maclean was prominent from midfield driving the team forward and this was to be the start of an astonishing fightback with fifteen minutes remaining. Kieran Rendall was first to score with a superb shot from twenty yards into the top corner and further chances were created with Lee Wilson finding himself through on goal only to shoot wide of goal. Bizarrely, the home team resorted to a great deal of time-wasting which was to prove costly in the end. After Darren Maclean had been fouled in the box, Lee Wilson redeemed himself with a cool finish which prompted a serious of missed chances in search of an equaliser with Kieran Rendall missing a free header from a corner, Graeme Murdoch failing to get enough on a cross inside the six yard box and Lee Wilson being the main opportunities. The Mintlaw team were reduced to the odd attack which Scott Russell dealt with on each occasion and it was from his clearance with seconds remaining in added time that lead to the fourth goal. 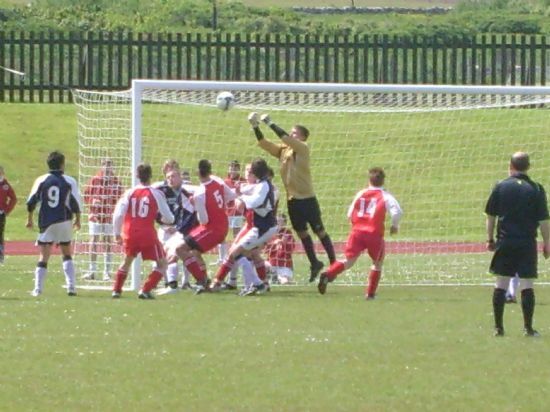 The clearance bounced over the Mintlaw right-back and Ryan Williams took the ball early looping a shot which the keeper got his hands to and as it looked as though it was to deny the leveller the ball dropped under the bar to give Orkney the equaliser in a dramatic comeback with players and coaches celebrating in unison. Summing up the trip, coach Ritchie Brunton was delighted with the level of performance in both games with Orkney creating numerous chances in each match and playing to a good standard which had been lacking in previous games this year. The team spirit was there to be seen to remain unbeaten on the trip and thanks also to those from Orkney who turned up to support the boys. 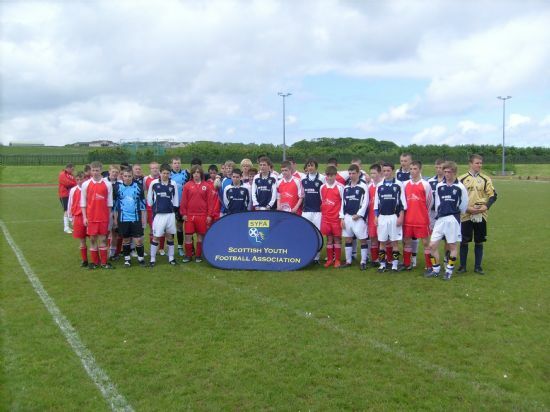 On Saturday 12th June, Orkney's Under 15s played host to the Scottish Youth Football Association Under 15s. This was to provide excellent experience and posed a significant challenge to the boys. Played in three 30 minute spells, Orkney started the first period in bright fashion. However, after an initial opportunity to score through Ryan Williams the National side soon got into their stride and their neat, quick passing and movement was to cause the home team many problems throughout the game. Orkney defended resolutely with Darren McLean, Jimmy Craigie and goalkeeper Scott Russell called upon to keep the away team at bay. This was shortlived however as the National side scored 3 quick-fire goals to end the first period ahead comfortably. Orkney made changes to try and gain a foothold in the game for the second period but it was much the same as before, whenever Orkney players got on the ball they were closed down immediately and could not gain any momentum in their play. Again, 3 goals were scored by the visitors. The final period and more changes saw a more determined home side begin to get closer to their opponents all over the park and this resulted in a spell of pressure where Lee Wilson was presented with a good opportunity to score but failed to hit the target. Shortly after, Darren McLean had a 20 yard effort which didn't miss the goals by much and some good crosses from Kieran Taylor gave Orkney a lot of encouragement. As the final period wore on the industrious Liam Drury had a terrific run up the left wing leaving 3 players in his wake but the end result came to nothing. Depite this spell of pressure Orkney conceded a further 2 goals to end the 90 minutes. Overall, coach Ritchie Brunton felt that it was a steep learning curve for the boys with a few of the Orkney players giving away 2 years to their more illustrious opponents. However, the boys will hopefully take a lot from the game with every member of the squad getting some game time as they now look ahead to a forthcoming trip South in July. 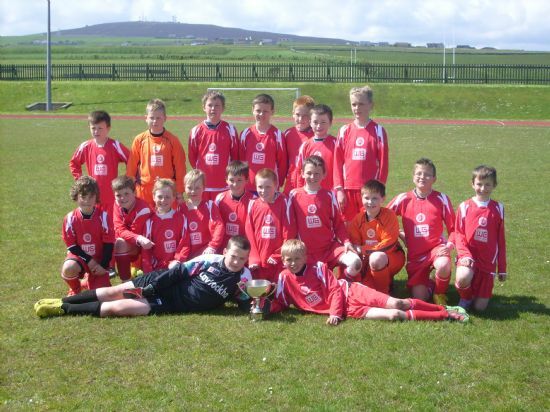 On Sunday 6th June Orkney played Shetland U12 in A & B games with the John Manson Trophy up for grabs in the A game. The A game started with Orkney looking the stronger of the two teams but they were not controlling the game as Shetland looked dangerous on the attack. Gradually Orkney began to create chances and missed 3 glorious chances with only the keeper to beat, but with some poor finishing and good goalkeeping the half ended 0-0. The second half was a different story as right from the start Orkney took the lead with good link up play from Ciaran Drever and Liam Delday allowing Liam to stroke the ball into the net and give Orkney the lead. Orkney did not wait long to increase the lead after good play on the right led to a corner for Orkney. Joe Wilson`s cross was met perfectly by Calum Drever who headed into the net much to the delight of the Orkney support. From then on it was mostly one way traffic with tireless running from the Orkney forwards Ciaran Drever and Alex Griffiths who were well supported by the midfield increasing Orkneys lead to 4-0 by both scoring a goal each. The game looked like ending 4-0 to Orkney until the final minute when another good piece of running by Alex Griffiths who beat the Shetland defence to make the final score 5-0 to Orkney. After the final whistle Jim Cormack introduced John Manson who presented the cup to Orkney captain Liam Delday. All the players are worth praise for a good team performance but a special mention must be made of Alex Griffiths whose tireless running made him Orkney A player of the match. 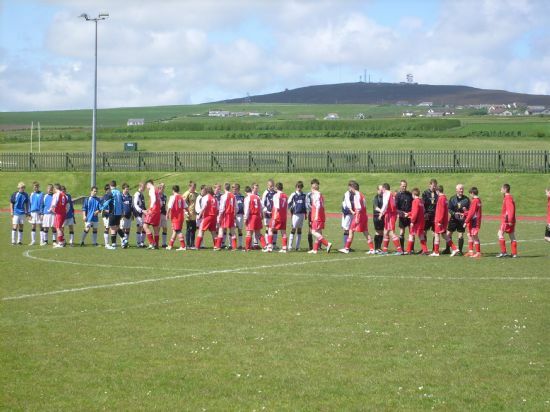 The B game is for both teams to give their younger players a chance and with Orkney playing 8 of their under 11 squad who were playing 11-a-side for the first time it was going to be interesting to see how they would do. This proved to be the most exciting game of the weekend as although not as many goals were scored the game flowed from end to end with lots of chances being created. Unfortunately from an Orkney point of view they had the clearest chances and some poor finishing and good goalkeeping kept Orkney at bay. Shetland will also feel the same with them creating chances and only some good goalkeeping keeping them at bay as well. Overall this was a fantastic performance by both teams and very much enjoyed by coaches, parents and supporters. The Orkney coaches could not ask for any more effort from the boys with Lewis MacManus voted Orkney B player of the day. After the Orkney B v Shetland B game an Orkney/Shetland select team was picked to play against ICT. 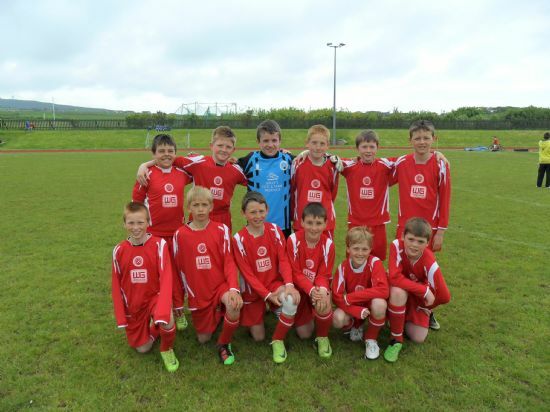 Unfortunately a few boys missed out on this game due to injuries sustained over the course of the weekend. However the select team gave ICT a good game and at half time the score remained 0-0. The second half was different as ICT started to control the game as the select team started to tire conceding 3 goals without reply. Although being beaten on the day the select team can hold their heads high considering that they had already played a 50 minute match prior to this. Orkney player of the game was Joe Wilson picked by Ronnie Duncan of ICT who generously presented Joe with an ICT top. 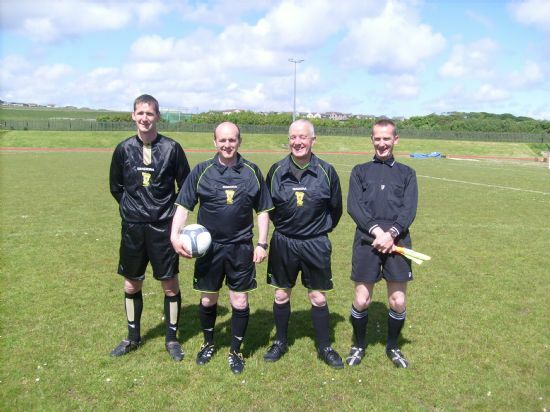 The OYDG would like to thank Ian Scott for refereeing the Orkney/Shetland select against ICT. The OYDG would also like to thank Shetland for coming down, Inverness Caley Thistle for coming up, the ground staff at Picky, the Stadium Cafe at Picky and the Rugby Club for opening up and allowing the Orkney and Shetland boys to mix prior to the Shetland boys catching the boat home. 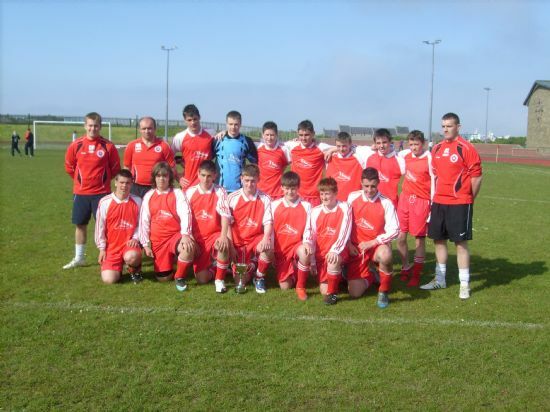 On Saturday 5th June, Orkney's Under 15s hosted Caithness with the home team hoping to defend the Loisburgh Utd Memorial Cup which they won in Caithness last year. A perfect sunny afternoon made for a good match but Orkney after a bright start, struggled to get any momentum into their play. It was Caithness who looked the livelier throughout and Darren MacLean in defence had to look sharp on a number of occasions with timely tackles on the Caithness forwards. In fact the only notable chance came at the end of the half for Orkney when Lee Wilson was presented with a chance but shot wide. After some stern words by coach Ritchie Brunton and a change in attack Orkney looked much brighter after the restart. Substitute Ryan Williams was linking up well with Lee Wilson and it was the former who netted the opener after calmly finishing off a through ball to put Orkney ahead. Caithness continued to apply pressure but were caught out when a run by Kieran Taylor saw a ball played into the box and the Caithness keeper conceded a penaly for a foul on Ryan Williams. A red card followed the keeper and Lee Wilson slotted home the penaly. Caithness to their credit did not give up and Orkney continued to lack fluency in their play but were happy when the full-time whistle blew. The coaches were happy to have retained the cup and to have kept a clean sheet despite a lacklustre performance. The game itself was played in the usual competitive nature with talking points as ever. Also taking place on Saturday was Orkney U13s v Caithness U13s on the outfield at Picky. With the teams having already played each other a week earlier in Dingwall, sharing a 2-2 draw a close game was anticipated. From the kick off the teams looked evenly matched but gradually Orkney started to control the game and missed 4 glorious chances before Ross Sclater gave them a well deserved lead. The lead did not last long however as the Orkney team went missing to allow what the Orkney coaches considered a soft goal. Just before the end of the first period Orkney`s lead was restored after a good through ball by Ross Sclater sent Joe Moar through to make the score 2-1. The second period was every bit as competitive as the first with Ryan Sutherland putting in some superb tackling along with Logan Peace and Taylor Pilkington Tait marshalling the defence. This resulted in Orkney scoring again after another through ball found Alex Stevenson who raced clear to make the score 3-1 to Orkney at the end of the second period. The third period of play was more open as both teams started to tire. Again Orkney`s defence stood strong with good tackling from William Humphreys and Mark Sinclair. Eventually Orkney again caught Caithness on the break with Alex Stevenson scoring his second of the day to put Orkney 4-1 up. With no more scoring the final whistle went to the delight of the players, coaches and supporters. With every player in the squad putting in a good shift it was Ryan Sutherland who was voted player of the match – well done Ryan. The OYDG would like to thank Robbie Norquoy for refereeing and Caithness for making the trip across. On Sunday 30th May Orkney played Shetland in county matches and at stake was the John W Shearer Cup donated by Mrs Mary Shearer in memory of her husband. The Orkney players arrived on the Sunday morning quite confident after the results from the previous day. First match on was Orkney B v Shetland A. The first half was nearly all Orkney but remained goalless until the final minute with Orkney having missed a hat trick of glorious chances eventually scoring in the final minute through Morgan Foubister to make the score at half time 1-0. The second half was the exact opposite with Shetland playing the better football they forced mistakes from Orkney and eventually ran out 3-1 winners. Next on was Orkney A v Shetland B which turned out to be a comfortable 2-0 win for Orkney and with a little better finishing in front of goal could have been even more. The Orkney goals came from Oskar Stout and Archie Macphail. The next game on was Orkney B v Shetland B. Unfortunately Orkney soon found themselves 1-0 down to a good attacking move by Shetland. The game looked like ending 1-0 but in the last few minutes Shetland scored again to go 2-0 up. Right from the restart Jas Sitte beat three Shetland players then passed to Ryan Wilkie to score and make it 2-1. Unfortunately time ran out to give Shetland their second victory of the day. 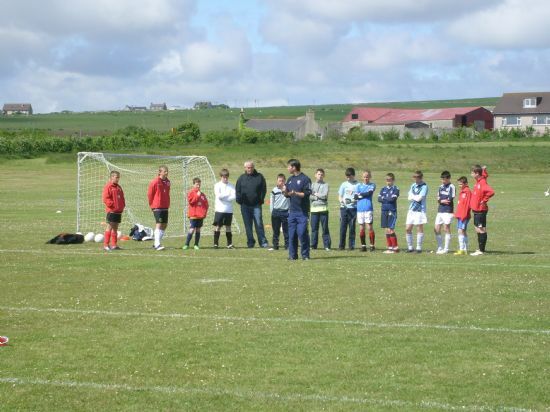 The last game on was Orkney A v Shetland A with Orkney requiring a win to force penalty kicks. In the first minute Orkney took the lead through a bizarre own goal. From then on the game was very close with both teams creating chances without scoring until the last minute when Archie Macphail forced an error by the Shetland defence to round the keeper and make the final score 2-0 and tie the scores at 2 wins each. As agreed beforehand if the overall points were tied penalty kicks would decide who won the cup and with both squads winning 2 games it was the dreaded penalty kicks that would decide who won the trophy. Fortunately for the Orkney boys Shetland missed all their penalty kicks with superb saves from Craig Drever for Orkney to win 2-0 and retain the trophy. Overall the Orkney coaches were delighted with the effort and performances against Shetland with every player from goalkeepers to forwards playing well. At the end of the day Jim Cormack the OYDG Chairman gathered all for the presentation where he thanked Lennie Merriman for refereeing and congratulated Orkney on winning the cup, he then presented the cup to Craig Drever the Orkney captain. Before the cup was presented player of the day pennants were presented by the Shetland coach to the boys who the coaches thought played best on the day. Winner for Orkney A was Greg Scott and winner for Orkney B was Jas Sitte - well done boys. The OYDG would like to thank Shetland for coming down, the ground staff at Picky, the Stadium Café at picky and the Rugby Club for opening up and allowing the Orkney and Shetland boys to mix prior to the Shetland boys catching the boat home. Overall a fantastic weekend was had by all. In the first game Orkney played some good football and greated several chances. Andrew harrold hit the bar with a great shot but Ross County were passing the ball better. Whilst Orkney put on a good performance they were unlucky not to score with the chances they had, and the final score ended 3-0 to Ross County. The second game was against Elgin City. Orkney started playing some really good football and after some pressure won a corner. Taylor Pilkington-Tait was unlucky to see his shot hit the post but Liam Delday put the rebound away to make it 1-0 to Orkney. Elgin then started to put pressure on the Orkney defence. After a number of corners Elgin equalized with a good header with only seconds left to play as a result of poor marking by Orkney. This was a game Orkney should have won. Next game up was against Caithness. Orkney started playing good football and after creating some good chances Ross Sclater put Orkney 1-0 up. Shortly afterwards Orkney were two goals ahead with another good finish by Ross Sclater. Caithness came back into the game and pulled a goal back, and right at the end of the match Caithness snatched an equalizer. Another game that Orkney should have seen out. On Sunday in the first game against Strathspey Thistle Orkney started very poorly and lost two early goals. Credit to the boys who got stuck in and came back into the game when Joe Wilson scored and a brace from Ross Sclater put Orkney 3-2 ahead. However for the third time Orkney lost a bad goal at the end and the final score ended 3-3. The last game of the weekend was against Elgin. Orkney played well in the first half and the half time score was level at 2-2 with another couple of goals from Ross Sclater. In the second half the Orkney boys started to tire and conceded two goals with the final score 4-2 to Elgin. All the boys played really well with some excellent performances from William Humphries, Ross Sclater, Liam Delday and the two goalkeepers Sam Kennedy and Kieren Doherty. All the boys enjoyed the weekend and it will provide very good experience for them in upcoming county matches against Caithness and Shetland. OYDG would like to thank Jimmy Poke and Geoff Facey for the safe journey down and back, and to the travelling parent who helped out over the weekend. There is an exciting season in store for the County youth teams with a full set of fixtures and visits proposed for 2010. There has been a major coup for OYDG in attracting the SYFA Under 15 Scotland Development Squad to play a competitive fixture against Orkney U15’s. This is the first time that a national youth team will have played against Orkney and will undoubtedly be the most eagerly anticipated match of the season. 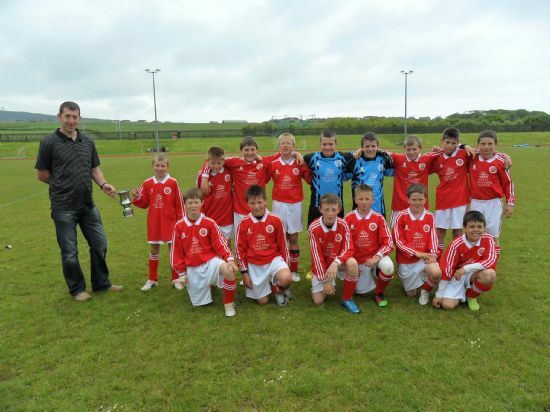 The Under 11’s will be looking to match the success of last year when they beat Shetland to win the John W Shearer in what was their first competitive match at this level. 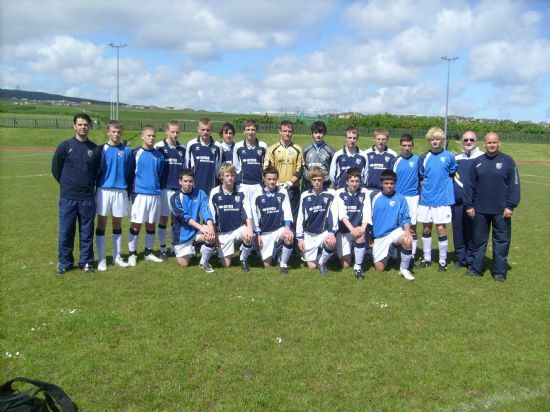 The squad for 2010 is: Craig Drever, Cavin Dunne, Zak Mathison, Sam Hunter, Greg Scott, Tom Flett, Jas Sitte, Ryan Wilkie, Niall Mackay, Aiden Groundwater, Connor Nicolson, Morgan Foubister, Oskar Stout, Archie Macphail, Sam Rendall, Calum Crawford, Rory Crawford, David Coates, and Scott Taylor. Coaches are Ian Stout, Ian Scott, George Low and Gordon Wilson. 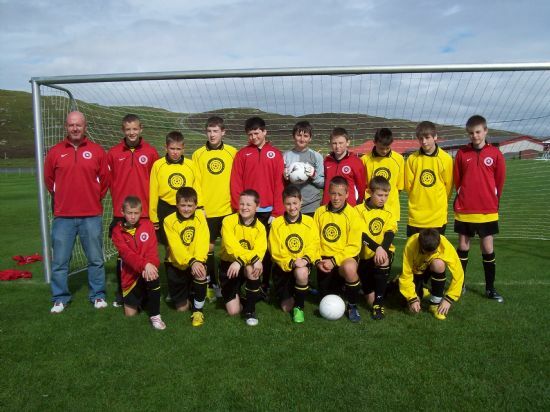 Last year was a disappointing year for the Under 12’s with a defeat in Shetland where they were well beaten and a narrow loss against Caithness in Thurso where they played well but lost after extra time. They were also unlucky in losing on penalties to Caithness United in a friendly played as part of the Youth Football Festival. With the bulk of last years successful Under 11’s having moved up to this level this promises to be a more productive season. 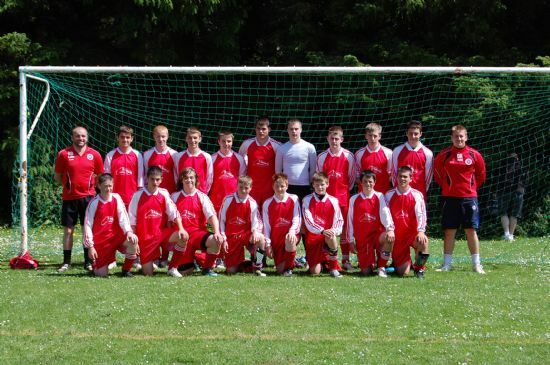 The squad for 2010 is: Lewis MacManus, Toby Macleod, Steven Low, Owen Harcus, Magnus Stephen, Joe Wilson, Ciaran Drever, Liam Delday, Sam Croy, Ben Stout, Robert Sinclair, Calum Drever, Connon Rendall, Kieran Learmonth, Alex Griffiths, Jack Mackay, Alex Stevenson. Coaches are George Stout and Dennis Macdonald. This Under 13 squad is now being established on a permanent basis to fit in with youth football age groups in other parts of the country. The Under 13’s had a taste of football at this level last year when they took part in a tournament at the Highland Football Academy in Dingwall losing three games and drawing one. As well as taking part in the same competition this year they will also be packing their bags for trips to Shetland and Caithness.The squad for 2010 is: Ronan Osborne, Kieran Docherty, Sam Kennedy, William Humphreys, Taylor Pilkington Tait, Jason Scott, Alex Stevenson, Jack Patterson, Andrew Harold, Logan Peace, Thorfinn Miller, Ryan Sutherland, Orran Fraser, Seamus Mackay, Mark Sinclair, Joe Moar, Fergus MacIvor, Ross Sclater, Joe Wilson, Steven Low, Liam Delday, Ciaran Drever, Sam Croy, Owen Harcus. Coaches are Geoff Facey and Gordon Wilson. This Under 15 squad is also being established on a permanent basis for the first time to fit in with youth football age groups in other parts of the country. 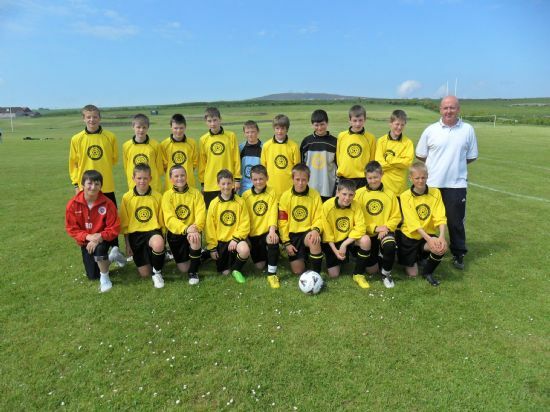 With last years Under 14’s having a successful season beating Shetland and Caithness hopes are high for this new team. 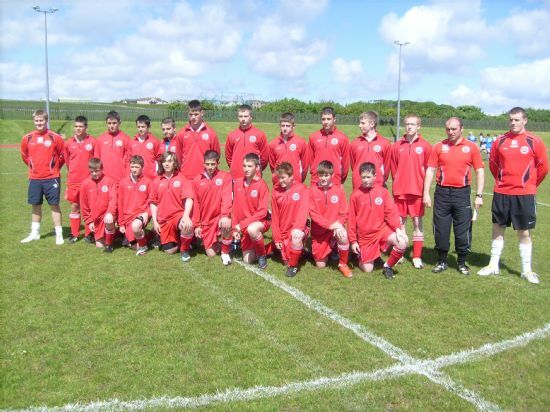 The team also has the added bonus of playing a glamour fixture against the Scotland Under 15’s which will allow them to play against the best in Scotland.The squad for 2010 is: Andrew Linklater, Toby Penwarden, Scott Russell, Chris McDonald, Liam Drury, Jack Stout, Darren MacLean, Ben Sutherland, Kyran Taylor, Kieran Rendall, Lee Wilson(Capt), Ben Lacy-Brown, Ryan Williams, Jimmy Craigie, Aiden Milne, Jake Mattews, Graeme Murdoch, Kyle Drever. Coaches are Ritchie Brunton, David Ryrie and Gavin Leask. Any player interested in representing Orkney and born on or after 1 January 1998 must take part in these trials. They will be held on Sunday 31 January, 14 and 28 February and on 14 March. Players should meet and register before each session in the Changing Rooms. There is a charge of £1 per player per session. Trials are held on the All Weather Pitch. No boots with screw in studs or blades are permitted. 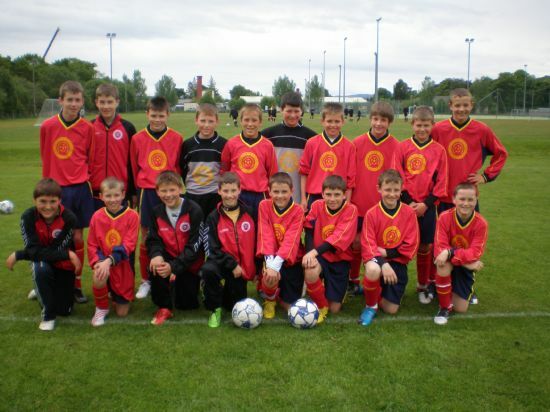 In 2010, there will be an Under 13 squad (players born on or after 1 January 1997) and an Under 15s squad (players born on or after 1 January 1995). 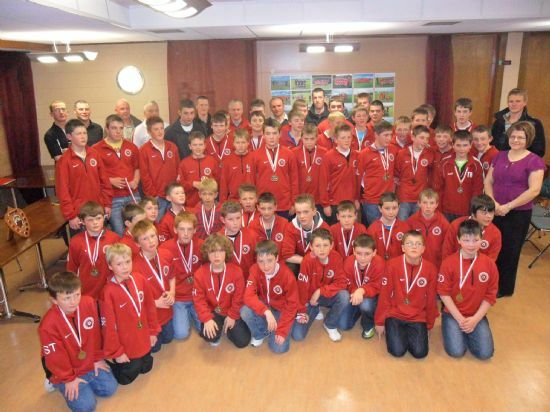 The dates of the Under 15 trials are Sunday 28 March, Sundays 4, 18 and 25 April, all between 2 and 4 pm at Picky and the dates of the Under 13's are Sunday 7 and 14 Jnauary between 2pm and 4pm at Picky.